The Tacloban Princess of Sulpicio Lines, although on a more minor liner route is one ferry that impressed me a lot because she is the only ferry in the Philippines that is under 100 meters in length and yet she has a passenger capacity of over 2,000 persons (2,009 actually) which means dense yet clever packing. With only 8,000 horsepower from two main engines, her passenger capacity to horsepower ratio is tops in the land for liners which means a very high efficiency for me in carrying people. Maybe during the time she was fielded in her Manila-Catbalogan-Tacloban route the sailing was still good and since this route had never had good container van load, probably Sulpicio Lines just decided to pack it in in passengers. Maybe, too, the bite of the intermodal buses (and trucks) in Eastern Visayas were not yet that big and painful when she was fielded and Sulpicio Lines still had high hopes for the route because in the past the Manila-Catbalogan-Tacloban route was a great route with many liner shipping companies competing including the biggest shipping companies in our seas then like Compania Maritima, William Lines, Aboitiz Shipping and many others which bowed out earlier. Probably, also, Sulpicio Lines which is in a one-upmanship game with its main rival William Lines do not want to suffer in comparison and heckling because some three years before William Lines fielded the first RORO liner in the route, the Masbate I (but not continuously at first) and this ship’s arrival was backgrounded by the infamous loss of their Manila-Catbalogan-Tacloban liner which was the ill-fated Dona Paz and they do not want a ship inferior to the Masbate I. The Tacloban Princess was Sulpicio Lines’ direct replacement for that lost ship (because the company stopped sailing liners to Tacloban after the disaster and only used the container ship Sulpicio Container VII to carry cargo but not passenger; maybe the feared a backlash). Maybe Sulpicio Lines felt they needed an impressive ship for their comeback and so they fielded the Tacloban Princess, and it be named after Tacloban City for acceptance of the public. So when she was fielded she was the biggest and the best in the route and obviously Sulpicio Lines wanted to salvage lost pride and prestige. Such was the historical background of the coming of the Tacloban Princess. In design and lines, I see a large similarity between the Tacloban Princess and the Manila Princess, another ship of Sulpicio Lines although the latter ship is bigger and was not built by the same shipyard and came two years later than the Tacloban Princess. In Manila Princess, Sulpicio Lines did not try anymore to “fill up” that “vacant area” after the poop deck and so there was no scantling above the stern portion of Manila Princess and container vans and other cargo can be stowed directly in that portion using the stern boom of the ship. In the Tacloban Princess, that “vacant area” or “free area” was fully built-up as a big Economy section and that boosted the passenger capacity of the ship (aside from also constructing passenger accommodations from the bridge of the ship up to the funnels). It seems Sulpicio Lines took care to make that stern section as it was beautifully done and her stern looked more modern than the stern of Masbate I. Looking at the quarter-front of the two competing ships, one can see a lot of similarity they being of almost the same size and built at about the same period and that reflects in the design of the ship. But it seems Sulpicio Lines stress more in the aesthetics of the lines and the superstructure and so the Tacloban Princess looked more modern and better pleasing to the eye. Of course, she would never have the lines and aesthetics of later ships as the bridge and forecastle section of the ship is something that is hard to refit or remodel. The Tacloban Princess started life as the Shinko Maru of the shipping company Nihon Kaiun KK. She was built by the Fukuoka Shipbuilding Company Limited (Fukuoka Zosen) in Fukuoka, Japan and completed in September of 1970 with the IMO Number 7106243. The ship’s length overall (LOA) was 98.3 meters and her breadth or beam was 19.2 meters and her original gross register tonnage (GRT) was 2,664 tons. Her original load capacity in deadweight tons (DWT) as Shinko Maru was 1,266 tons. In Japan the ferry only had two passenger decks and she had no scantlings beyond the funnels. The ship was fitted with two small engines much like in the mold of the sister ships Our Lady of Fatima and Our Lady of Lourdes of Carlos A. Gothong Lines Incorporated . Her twin engines developed only 8,000 horsepower (it seems these ROPAX ships of about 100 meters in length only has about 8,000 horsepower) but her original sustained top speed was decent at 18.5 knots which was the same as the Gothong sister ships. Here with the added metal and additional age the most that can be coaxed out of her two Niigata engines was only 17 knots but that was already good enough for her size, her route and the general expectation of her shipping era. Actually when she was fielded in the Manila-Catbalogan-Tacloban route she became the fastest liner there and equal to the fastest that sailed there before, the Tacloban City of William Lines. The Shinko Maru came to the Philippines for Sulpicio Lines in 1990 and she was refitted in Cebu. Another deck was added at the bridge level and after the funnels two and a half passenger decks were added. Since the funnels were near midship, in totality in area of the passenger accommodations of the ferry more than doubled. That system of refitting and the increase in passenger accommodations were the norm of the era much to dramatically increase the passenger accommodations but to the consternation of the Japanese builders and designers but as a general rule they don’t sink or capsize (contrary to what old ship haters with vested interests say now). But the depth and the draft has to increase to maintain stability. Speed however suffers because of the additional steel and the greater draft. 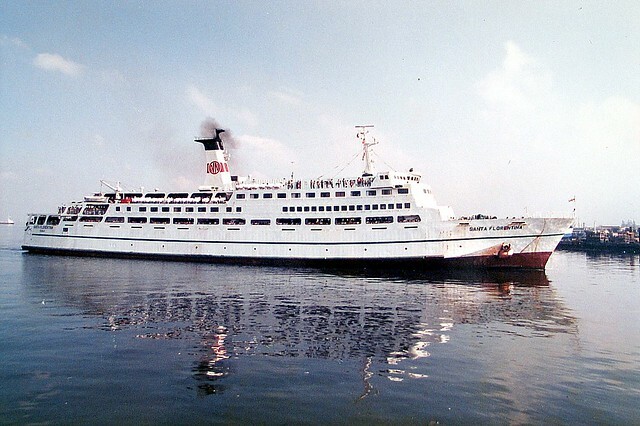 The maiden voyage of Tacloban Princess was on August 5, 1990 (and with her forthcoming fielding William Lines withdrew their aging and slower already cruiser ship Tacloban City and replaced her permanently with the RORO liner Masbate I. She leaves on Wednesdays at 12 noon for Catbalogan and arrives there 22 hours later and she will depart for Tacloban at Thursdays 1pm and will arrive there at 5pm (which is a little late already for those still needing connecting trips). Departure back to Manila will be Fridays at 12nn and arriving in Catbalogan 4 hours later. The ship will then depart at 6pm and arrives in Manila on Saturdays at 5pm (well, it seems she is fond of late arrivals). The second round-trip voyage of Tacloban Princess within the same week will be a direct one to Tacloban leaving on Sundays at 10am and arriving in Tacloban on Mondays at 1pm. She will then depart Tacloban Monday 4pm (it seems there is really not much cargo if she can leave after only 3 hours in port) and arrive in Manila Tuesdays at 4pm. The Tacloban Princess like her competitor Masbate I was a popular commute to Manila in the early 1990’s when the buses and short-distance ferries were not yet many. Her appeal lies in the free meals and the bunks where one can rest fully. Besides her travel time to Manila is equal that to the bus (if from Tacloban) while being more comfortable and with more amenities than the bus. However, she only had two trips in a week (but then Masbate I also has two trips a week). But then the Cebu Princess, also of Sulpicio Lines still had a Manila-Masbate-Calbayog-Catbalogan-Ormoc-Cebu route then and the Sweet Sail of Sweet Lines also had a Manila-Catbalogan-Tacloban route then. Beside Carlos A. Gothong Lines Inc. also tried a Manila-Catbalogan-Tacloban route (yes, that was how strong this route was then before it was eaten alive by the intermodal system). And so practically nearly everyday there was a ship to Manila and so the appeal of the daily departures of the bus was not that great yet then (I wonder if these competitors realized it then that they were actually “frenemies” but that term did not yet exist then). In due time, however, the buses and the trucks increased in numbers, they became more ubiquitous with more routes (it was not up to Tacloban mainly anymore but to almost all points of Leyte and Samar islands) and more powerful units (both buses and trucks and the latter segment already had wing van trucks which were built for ease loading and direct delivery). And one strength of the many colorum buses is they know how to search for passengers (they don’t just wait for them to pop up in the terminals). They had the advantage of multiple daily departures and the capacity to pick up or drop by the gates of the houses of the passengers. Plus for those just going to CALABARZON the advantage of taking the bus over the ship is much greater (as in they need not backtrack from Manila anymore). Besides going to or coming out of North Harbor increasingly became more difficult for the passengers compared to the Pasay or Cubao terminals and the Alabang and Turbina pick-up of the buses. I remember then that the buses coming from Eastern Visayas would stop by the eateries before the ascent to Tatlong Eme. There for two pesos one can take a bath from a very strong spring water piped in straight from the mountain and it is so strong one will feel as if he is drowning (but then rinsing takes a very short time only and so the bus need not wait long). Passengers then will arrive in Manila still feeling fresh. Like the ships the Eastern Visayas buses will take in any volume of passenger cargo and will even allot the seats for it for a fee. Passengers will willingly pay for it because getting it to the pier or out will cost money from porters who demands high porterage fees (or from taxi drivers that will demand “special rates”). Before the end of the millennium, however, shipping in Eastern Visayas has already showed signs of distress. The buses and the trucks got more experienced and more organized and additional ferries arrived in the San Bernardino Strait crossing and so more schedules were available. Meanwhile, Sweet Lines and Carlos A. Gothong Lines quit the route and so there were less ships going to Manila. Even before this happened in the Catbalogan/Tacloban route the liners from Manila has already been driven away from Northern Samar and next the Cebu Princess of Sulpicio Lines has to drop the Calbayog call on the way to Ormoc from Masbate and to think Sulpicio Lines has the reputation of being very gritty in terms of abandoning ports of call. The intermodal buses and trucks were already eating the business of the liners even before the last millennium ended. At the start of the new millennium the Tacloban Princess was forced to drop the Catbalogan port of call and just make two direct Tacloban voyages in a week. She would leave Manila on Wednesdays at 9am and arrive in Tacloban Fridays at 3pm (which means she slowed down already). She would leave Tacloban on Fridays at 12nn and arrive in Manila on Saturdays at 6pm. Her second voyage to Tacloban would leave on Saturdays at 12 midnight and arrive in Tacloban on Mondays at 6am. She will then forthwith leave Mondays at 12nn and arrive in Manila on Tuesday at 6pm (I never liked these arrivals in Manila; these played right into the hands of the unscrupulous drivers and the holduppers). The Tacloban Princess was then only running at 13 knots and the buses were already faster than her (which normally don’t take more than 24 hours from Tacloban). That was a killer and the end of the line was already showing and only cargo was sustaining her now (plus the diehard ship passengers). But I was already wondering then if the revenues was still enough to sustain her operations but I heard the oldies of Sulpicio Lines are sentimental that they will never really give up on routes (or even of ships). During that time I was wondering if it is better for Sulpicio Lines to just transfer the Tacloban Princess on another route (and just leave the Cebu Princess and the Palawan Princess on the eastern seaboard routes). I thought Sulpicio Lines was a little wasteful on ships in that part of the country when the handwriting on the wall was already very obvious – that the end I nearing. I thought they could have replicated what Gothong Lines and William Lines did then and combined the Ozamis and Iligan routes (that meant the Cebu Princess will take the Masbate and Tacloban plus the Ormoc routes). Of course if she is transferred she will be up against superior ships of WG&A which with the disposal of their 16-knot ships has none sailing at less than 17.5 knots (but then the Dipolog Princess serving Iligan was also inferior during that time already). But then I know that move could send the Dipolog Princess to the breakers (but by then the comparative Iloilo Princess was lost by fire and she could have taken in its Puerto Princesa route). But then why not swap her with the bigger and faster Princess of the Ocean which was just being used in the overnight Cebu-Cagayan de Oro route? I thought her lack of speed could be hidden there like the Our Lady of Good Voyage. She will be competing with that ship and she is near-parity in size, speed and accommodations. But then Sulpicio Lines was just using the probably more than equal Princess of the Earth in the Cebu-Nasipit route where the big but unreliable Nasipit Princess stayed for long. Sometimes I can’t get the logic of the fielding of ships of Sulpicio Lines. They could have swapped Tacloban Princess for Princess of the Earth and the latter could have been sent to the Palawan routes and she would have been more competitive there to the Aboitiz Transport System (the successor company of WG&A) ferries. I also thought she could have been swapped with the faster Princess of Carribbean since the Tacloban route does not have much cargo (and the cargo capacity of the Princess of the Caribbean is limited being a cruiser ship). She could then make a three times a week voyage to Tacloban and a modus vivendi could be sought with Aboitiz Transport System (ATS) to also field a fast cruiser (like if they did not sell the Our Lady of Naju) so a six times a week sailing to Leyte could be made (the point of departure could also be Ormoc and the route will be shorter and shuttles could be employed to bring the passengers to and from Tacloban and Maasin; and container vans will be hauled too). But I knew even then such idea is too farfetched as ATS was simply too proud and blind and will rather give up an area as big as a region rather then fight the intermodal buses and trucks (and it is just easier to blame everything to the budget airlies but that palusot will not fly in Eastern Visayas as everybody knows the passengers went to buses and not to the airlines). Later on, the Tacloban Princess had bouts of unreliability, I heard, and sometimes she can’t be seen and the Cebu Princess will make a Manila-Masbate-Tacloban route with a diversion to Cebu. Sometimes it will be the Tacloban Princess making that route and Cebu Princess will be out (it seemed then it was only the ancient Palawan Princess which was always ready to sail the eastern seaboard routes). That time Sulpicio Lines doesn’t advertise much in the papers like before and so monitoring was more difficult. Whatever it can be seen that Sulpicio Lines was making great effort to retain the Eastern Visayas ports of call (and Masbate too) against the relentless onslaught of the intermodal buses and trucks (and almost alone). I heard also then that after a long furlough Tacloban Princess’ engines were being rehabilated. Sulpicio Lines does not easily give up on ships. Well, if they can retain the Palawan Princess and the Dipolog Princess that came in the 1970’s and were obsolete cruisers then why not the better Tacloban Princess? Their antiquated Palawan Princess, to think, was still doing a Leyte route when that ship was built in the 1950’s and was the only liner left without airconditioning. But one incident and factor dashed all the hopes for the Tacloban Princess. Of course, Sulpicio Lines did not expect another incident on the scale of the Dona Paz tragedy will happen and this time it will doom the entire passenger shipping of the company. Their flagship Princess of the Stars sank in a storm in 2008 and in the aftermath of the reactions Sulpicio Lines was suspended from passenger shipping and in order to get back, stringent conditions were demanded by MARINA (the regulatory agency Maritime Industry Authority) from the company. In the early days of the suspension (which was killing to the mechanical viability of the ships), Sulpicio Lines decided to sell ships to raise cash and among the victims were the Tacloban Princess along with the highly-regarded Princess of Paradise and Cotabato Princess (and in this sense, the Cebu Princess and Cagayan Princess were luckier as they went to Roble Shipping and not to the breakers). The Tacloban Princess was bought by a Tayud shipyard in Cebu for breaking as we heard. World metal prices was still high then and no shipping company was shopping for a liner as the liner industry was obviously on the way down already because of the growing shares of the budget airlines, the forwarding companies and the intermodal trucks and buses. However, while in the shipyard the Tacloban Princess caught fire and was reduced to charred metal. The incident just made her chopping faster. And so in 2009 Tacloban Princess was already dead, killed by the aftermath of the sinking of the Princess of the Stars. Maybe if she was just the size of an overnight ship she might have survived like the Cebu Princess and Cagayan Princess. Selling under pressure just kills ships. Many people would not look much at them and much more admire them especially since bigger liners came so soon after them but to me the 110-meter RORO liners also occupy a certain niche in our shipping history. They actually arrived when our shipping companies were reeling from financial crisis, there were not much incentives yet from the government and interest rates were still very high and actually the first ones were acquired when the country was in great crisis, politically and economically during the meltdown of the Marcos dictatorship. Many of these liners were built up to maximize passenger capacity especially the latter ones to better fill up our lack of bottoms (ships) then that when I look at these liners what comes to my mind is that they are the passenger equivalent here of the “pocket battleships” which tried to do the role of their bigger counterparts but of course they didn’t have their punch nor even their speed. When these “pocket battleships” came what was then still ruling our waves were the fast cruiser liners, the biggest of which were also in the 110-meter class. To the first which acquired the 110-meter liners it looked to me that they were trying to leapfrog the main “practitioners” of the fast cruiser liners which were Sulpicio Lines and William Lines which were then already occupying the Top Two in the local totem pole of shipping since ertswhile leader, the venerable Compania Maritima was already in its final tailspin. However, they did not vault to top slot since vaulting to that place mean steady and programmed acquisitions of ships in bigger numbers, as shown by experience and history. I would say though that it was a brave move by them especially it came in a period of great crisis. The early main “practitioner” of the 110-meter RORO liners was, you guessed it, was the first bringer of the fast luxury cruiser here and that was the still-revered-up-to-now Sweet Lines. Was anybody surprised? They did this by bringing in the replacement of the revered Sweet Faith, the first fast luxury cruiser in the country which was broken up in 1980. 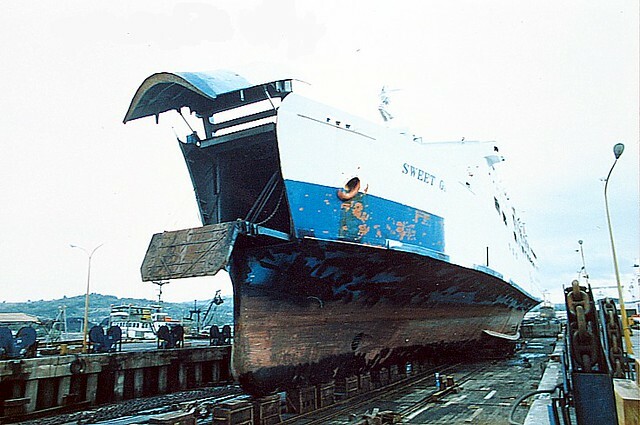 The replacement ship was the Sweet RORO which came in 1982 and like the Sweet Faith the ship was a pioneer. This ship was the former Ferry Ruby of the Diamond Ferry of Japan and she was built by Onomichi Zosen in 1970. This ferry was 117.5 meters in length with a design speed of 18 knots which converted to about 17-17.5 knots here (and maybe a little forced, I think), enough to keep up with the fast cruiser liners then sailing at 18 knots. Sweet RORO had a passenger capacity of 1,700 persons which was higher that the fast cruiser liners then that were slightly smaller than her. The next year, Sweet Lines brought in the Sweet RORO 2 which later became the future Sweet Glory in their fleet. Though technically not a 110-meter ship as her length was 120.8 meters but then for all practical purposes she was also a 110-meter class ships. This ferry was the former Ferry Katsura of the Osaka Kochi Express Ferry in Japan and she had an original top speed too of 18 knots like the Sweet RORO. However, her passenger capacity is rather low at only 1,301 but that figure is about the same as the passenger capacity of the competing fast cruiser liners then. But then being taller, the RORO liners have a greater gross tonnage compared to a fast cruiser liner of the same length which means she has more available passenger space. It was Negros Navigation which was the second local shipping company to have a “pocket battleship” when they acquired the Santa Florentina in 1983 which was the replacement for their fast cruiser liner Dona Florentina which was hit by fire and beached in the same year. The Santa Florentina was the former Okudogo of Kurushima Dock, a shipyard which operated ships to keep them sailing. This RORO liner was really a “pocket battleship” because her passenger capacity was super-maxed at 2,155. She was only the second local liner whose passenger capacity exceeded 2,000 after the Dona Virginia of William Lines and hers was even slightly higher and so when she was fielded she was the record holder as the liner with the highest passenger capacity in local waters. And to think the Dona Virginia‘s length was 143.5 meters although their gross tonnages are just about the same (hard to say which really has the greater GT as the GT of both declined from Japan and that measure is commonly understated here). With the great economic and political crisis that started to peak in 1983 with the assassination of Ninoy Aquino, the acquiring of liners in this class halted. Interest rates were crazy then and it was really hard to find financing especially if the money needed was in foreign currency (as our dollar reserves were already too low then). Actually, in the succeeding two years, 1984 and 1985 no liners were ever acquired save for the small liner Princess of Antique of Palawan Shipping and the only other steel-hulled ferries ever acquired in those two years were the Leyte Queen of K&T Shipping (the later Leyte Star of Maypalad Shipping), the Viva Sta. Maria of Viva Shipping Lines and the Dona Cristina of Carlos A. Gothong Lines which were just overnight ferries whose length are much less than 100 meters. Also coming in 1984 was the Maharlika II of the government which was a locally-built ship and might have been delayed in completion because of the crisis. In 1986, only two small liners were acquired, the Our Lady of Guadalupe of Carlos A. Gothong Lines and the Boholana Princess of Sulpicio Lines and both of those were also below 100 meters in length. It was already in 1987 when the crisis started to ebb with the overthrow of the dictatorship that bigger RORO liners were again acquired. Sweet Lines led the way with the acquisition of the Sweet Baby, the former White Sanpo in Japan which was actually not in the 110-meter class technically because she was 125.6 meters in length but her gross tonnage was also just 4,545 and just about the same as the Santa Florentina of Negros Navigation. Her passenger capacity was not maxed (only 1,550 persons), her superstructure was not modified and she was just like the earlier Sweet Faith whose passenger accommodations were all airconditioned. However, she was faster as her design speed was 19.5 knots because she possessed bigger engines than the 110-meter class ferries. There was a liner that came for Negros Navigation in 1988, the Sta. Ana that for all practical purposes was like a 110-meter liner especially since she was fully built-up and her superstructure extended fully from side to side and her gross tonnage was high for the 110-meter class. She was actually only 107.3 meters in length but her gross tonnage was 7,909 and her passsenger capacity also breached the 2,000 mark at 2,106. She had a design speed of 21 knots which was high for the 110-meter class. The ferry was the former Nichinan Maru and Ferry Muroto in Japan and she was built in 1973 by Hashihama Zosen in Hashihama Japan. She was acquired from Muroto Kisen K.K. A true 110-meter ferry came here the next year 1989, the former Emerald Amami of the A” Line which came to William Lines as the Zamboanga City. At other times this RORO liner was simply known as the Zamboanga. She was 117.1 meters in length and unlike the others she had a cargo boom at the front of the ship. This ship was built by Niigata Engineering in Niigata Japan in 1975. The ferry had a passenger capacity of 1,875 persons and her sustained top speed was 20 knots (although her engine horsepower was high for a 110-meter class ferry). After 1989, there was a lull in the acquisition of 110-meter ships. What was happening then was bigger RORO liners at 120, 130 and 140 meters were being acquired by the shipping companies. The economic conditions then were already better, interest rates had subsided and economic activity and optimism picked up and so maybe the liner companies thought it was time to go for bigger ships. It was only in 1992 when another 110-meter liner came when Negros Navigation acquired the sister ship of the Santa Florentina, the Okodugo No. 2 in Japan which became their flagship Princess of Negros. This ship has the same external dimensions of her sister ship but her passenger capacity was not maximized so it only stood out at 1,499, just some 70% of her sister ship which translates to more available passenger areas. Studying the superstructures of the two they were similar but not really identical. Like her sister ship, this ferry was also built by Kochi Jyuko in Kochi, Japan but in 1973 (her sister ship was built in 1972). She was purchased from Ehime-Hanshin Ferry K.K. Another 110-meter RORO liner came to Negros Navigation in 1993 and like the Princess of Negros the passenger capacity was not maxed. This was the San Paolo which was 118.0 meters in length and had a passenger capacity of 1,750 persons. The ship has a design speed of 19 knots and she was the former Saint Paulia of the Nippon Car Ferry in Japan. I thought then for the Iloilo and Bacolod routes of Negros Navigation this size and their speed was just enough but later Negros Navigation Company (NENACO) acquired bigger and more beautiful ships because although they have a monopoly in Bacolod their competition Aboitiz Shipping, William Lines and Sulpicio Lines were showing bigger ships (although not necessarily better except for one the Mabuhay 1) in Iloilo port. The battles of prides, bragging rights and one-upmanship was probably the main reason why in so short a time our RORO liners got bigger and bigger and faster and faster (was there really enough economic reason for that then?). Until now I still have doubts about the fit of those ferries but hey! from the passenger side they were really great and I personally enjoyed them. Such was the optimism of those years. In 1993 also, Aboitiz Shipping Corporation which was on the comeback trail in liner shipping rolled out their SuperFerry 3 which was only 118.0 meters in length and breadth like the San Paolo (and they could actually be sister ships) but the passenger capacity of this ferry was super-maxed at 2,116 a la Santa Florentina and Santa Ana. The SuperFerry 3 was the former Hamayu of Miyazaki Car Ferry in Japan and built by Hayashikane Zosen in 1971. Her design speed was 20 knots but here she only runs at 16 knots because actually her engines were actually a little smaller than the other 110-meter RORO liners. As a note, she might have been the last 110-meter RORO liner “pocket battleship” fielded because our liners then became bigger as the years went by and they looked like small already compared to those aside from the disadvantage of a slower speed. On another note, there was a Japan-Korea ferry that came here in 1993, the former Ferry Kampu. 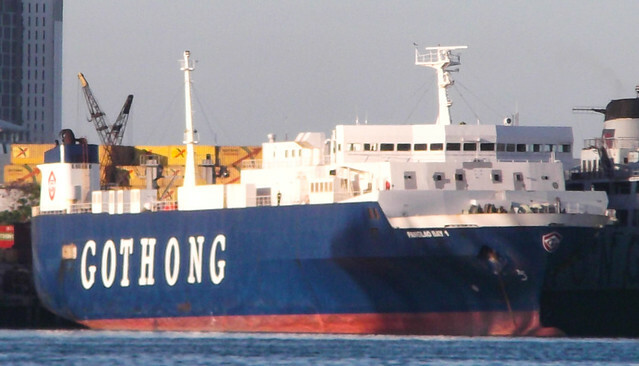 She was not used as a RORO liner but as an overnight ferry of Carlos A. Gothong Lines in the Cebu-Cagayan de Oro route. In appointments she could have been a liner. This was the Our Lady of the Rule which was 114.7 meters in length. An overnight ferry she only had a built-up capacity for 1,170 persons which was rather modest but just enough for an overnight ferry. If she had an Achilles heel as a liner is her design speed is only 16.5 knots and translated here that might come out at only 14 knots which is more or less unacceptable for a liner and so maybe that was the reason why she just became an overnight ship in the premier Visayas-Mindanao route. This ferry was built by the little-known Taihei Dockyard in Akitsu, Japan in 1970. After 1993, the 110-meter “pocket battleship” seemed passe already and none came anymore. Our liners became bigger and faster and these “pocket battleships” were looked down by some already especially they cannot match the bigger RORO liners in speed. That was especially true after the “Great Merger” which produced WG&A when speed was one of the selling points and these “pocket battleships” are finding difficulty looking for “appropriate” routes and they were often shunted to minor routes except for Negros Navigation which continued to use them in the Iloilo and Bacolod routes but with more difficulty. Of the “pocket battleships” it was the San Paolo of Negros Navigation which lived the longest and she sailed until the era when liner patronage has already slipped so much. She was finally sold to the breakers in 2011 and this class of liners ceased to exist locally. As a last note, the Trans-Asia 3 of Trans-Asia Shipping Lines is also 110 meters in length but she is an overnight ship. However, she can be a future template of a revived 110-meter liner class for the current era when liner patronage is no longer strong. She is fast with a design speed of 20 knots from just 9,000 horsepower combined engine output because she is more modern. As such she can match the speed of the 130 to 140-meter class ferries of before which came here which sailed at 17.5 to 18 knots locally. I think it is time to revive now the 110-meter RORO liner class. This article is about the liner San Lorenzo Ruiz of Negros Navigation and not the short-distance ferry-RORO of Viva Shipping Lines of Batangas. It was just a wonder from me how come MARINA allowed the use of the same name for two different ROROs when that is not normally allowed. And so because of that some people became confused especially if they have not seen the two liners. Actually one won’t see them at the same time because they have different ports of calls and routes. The nearest the two will be near each other was if they were at the same time in Verde Island Passage between Batangas and Mindoro when they are crossing each other’s path as the Viva Shipping Lines vessel is a Batangas to Mindoro ferry and the Negros Navigation ferry uses the strait on the way to the Visayas and Mindanao. The San Lorenzo Ruiz is one liner I like for its economical design because it is much like the SuperFerry 2, SuperFerry 5, Mabuhay 2, Princess of the Pacific, Princess of the South, Our Lady of Banneux and Cagayan Bay 1. The class they are in have the length of between 128 to 143 meters (or roughly the 130-meter class) with engines between 15,000 to 16,000 horsepower and with a design speed of about 20 knots and a local speed here of about 18 knots after the addition of metal in the superstructure and the passing of nearly two decades of service. This class has the capacity of some 100 TEUs of container vans which is about enough for the local routes. The class’ speed, capacity and amenities are adequate too for a liner and passenger accommodations don’t have to be so maximized unlike the 110-meter liners. This class has definitely more speed too than that class although they don’t have the 20 knots here of the 150-meter liners with 20,000 horsepower engines but their fuel consumption is definitely less. This class is actually what is perfect for the routes that are not serving Cebu, the country’s premier city and port south of Manila. The speed differential between an 18-knot liner and a 20-knot liner is really not that great. Going to Cebu and rounding the eastern side of Mactan island, the latter will have a transit time of 21 hours and the former will have a transit time of about 22 hours. At 17.5 knots, the SuperFerry 2 and SuperFerry 5 also can do it in 22 hours because they need not use the eastern seaboard of Mactan for the reason that they can pass under the two Mactan bridges because they have folding stern masts. To me it was even a puzzle why so many of our liners were in the 150-meter class with 20,000 or so horsepower and 20 knots. In terms of container capacity the difference is not great since their breadth is just about the same of the 130-140 meter lines. But 15,000 to 16,000 horsepower is much less than 20,000 to 22,000 horsepower in terms of fuel consumption. Well, actually at the height of fuel prices a few years ago the 2GO itself downgraded the engine speeds and consequently the ferries’ speed to save on fuel. Few really run at 20 knots nowadays and that just proves that 20 knots was really never necessary. The ROPAX ship San Lorenzo Ruiz of Negros Navigation was built by Nipponkai Heavy Industries Co. in Toyama, Japan in 1973 as the Al Nasl of the Taiheiyo Enkai Ferry KK of Nagoya, Japan with the IMO Number 7302093. The ship was 132.1 meters in length over-all with a length between perpendiculars of 124.0 meters. Her breadth was 22.7 meters with an original gross register tonnage (GRT) of 6,844 tons and an original deadweight tonnage (DWT) of 2,480 tons. The ferry was powered by two IHI (Ishikawa Heavy Industries)-built Pielstick engines developing 8,000 horsepower each for a total of 16,000 horsepower and that gave the ship a design speed of 19.5 knots. Her specifications wer actually very near that of the sister ships SuperFerry 2 and SuperFerry 5 which measured 138.6 meters by 22.1 meters and was powered by two MAN diesels built by Mitsubishi Heavy Industries with a total of 15,200 horsepower and a design speed of 19 knots. Although twin-engined, the ferry was equipped by a single, center funnel with the stern mast atop it and she had a distinctive bridge that is slanted forward from the top to have a better lower view. She had one full passenger deck plus two passenger-half decks at the front. Al Nasl has a sister ship, the Argo and they sailed the Nagoya-Nachikitsuura-Oita route of Taiheiyo Enkai Ferry, a route from the main island of Honshu to the Kyushu island in the south. In 1976, however, the ship was sold to Nippon Car Ferry and she held the route to Ebino city in Kyushu island and thus she was named as the Ebino. As the ferry to Ebino this ship had a passenger capacity of 695 and about 500 lane-meters in rolling cargo space. In 1996, the Ebino came to the Philippines to be the San Lorenzo Ruiz with the Mary Queen of Peace, another former Nippon Car Ferry ship. Maybe the connection started with the San Paolo which arrived for Negros Navigation three year earlier and which was another ship from Nippon Car Ferry. In the Philippines, a partial scantling up to the funnel was added in the navigation deck to hold the Economy class. The passenger capacity of the ship in the Philippines was 1,426 persons only as Negros Navigation chose to not massively change the superstructure of the ship anymore. Because many of the Japan features were retained she had the reputation of having good interiors. Of course with 3,911 in net tons she had plenty of space for passengers. However, although scantlings were added the gross tonnage of the ship went down to 6,051 but her deadweight tonnage rose to 2,995 tons. For cargo handling, the ship only had a stern ramp. Many however, said the lines of the ship was beautiful and I agree with that. The San Lorenzo Ruiz was used by Negros Navigation in opening their Manila-Iloilo-General Santos City-Davao route. In this route she was in competition with the SuperFerry 1/SuperFerry 8/SuperFerry 10 team-up of WG&A which was a mean line-up of former flagships and gives up nothing to her in amenities and facilities but were a little superior to her in speed. They actually share the same route exactly but where the WG&A line-up can do 20 knots the San Lorenzo Ruiz can only do 19 knots at most. But I wonder why in a Negros Navigation advertisement she was declared sailing at 19.5 knots, her design speed. It might have been possible but that means running at 100% engine speed and that is a killer for a 23-year old ship (later she developed a reputation for being “slow”). She had only a declared passenger capacity of 920 passengers in the advertisement (versus the declared 1,426 in MARINA files and a later 1,850 from another source) but her declared cargo capacity was 140 TEU, higher than the normal 130 to 140-meter ROPAX. That means she retained the partial cargo deck at the “B” level supporting the observation that her conversion here was really not much. Probably, the passenger capacity was only right as they were new in the General Santos City and Davao route. On the other, being new the container capacity might have been high. Just the same, her size might have been just perfect in a newly-developed route. On the Sulpicio Lines side, she was competing with the Princess of the Pacific in the General Santos City route, a ship with almost the same size as her and almost the same horsepower and powered by twin Pielstick engines also. In the Davao route she was up versus the super-big and fast Filipina Princess whose amenities might not as impressive as her being an older ship in terms of fielding here. Like other Negros Navigation ships her higher accommodations have many variations from Suite to Single Suite to Admiral Suite, Deluxe Cabin, Business Class to Tourist Class, Travelers Class and Tatami Class. I like the Tatami Class because I like to sleep on the floor (with mattress) and I can lie with my shoes on and use my knapsack as mattress and not worry about them getting stolen. I hate sleeping in upper bunks and good that the Tatami Class don’t have them. After two years Negros Navigation withdrew from the Davao route and just used one ship and modified the route of the San Ezekiel Moreno to Manila-Iloilo-Zamboanga-General Santos City-Davao (that ship had a Manila-Iloilo-Zamboanga-General Santos City route before). The San Lorenzo Ruiz then did the Manila-Iloilo-Ozamis-Iligan-Manila route and Manila-Dumaguete-Tagbilaran-Manila route within the same week. I thought this were very good routes for the San Lorenzo Ruiz as it combines near ports without backtracking and two complete voyages are completed in week which means a high efficiency in the use of the ship. But of course, the giant WG&A have heavy presence in those ports of call and Sulpicio Lines is also serving those ports also but the exact routes of the ships of Sulpicio Lines and WG&A varies with that of the San Lorenzo Ruiz. In Iligan and Ozamis, the San Lorenzo Ruiz was up against the SuperFerry 2/SuperFerry 5/SuperFerry 9 team-up of WG&A and all three of those were about the same dimensional size and engine size of her and so it was probably an even match even in amenities. She was also against that team-up in Dumaguete. In the Tagbilaran and Dumaguete combined route she was up against the SuperFerry 3 and she has a big advantage over this ship in speed, in paper as that ship only has 9,300 horsepower in total. In Tagbilaran she was also up against the Our Lady of Sacred Heart and Our Lady of Medjugorje pairing of WG&A and again she had great advantage in speed and even in amenities aside from the space. She was also superior in everything over the Princess of the Caribbean of Sulpicio Lines in Dumaguete and Ozamis (or the Iloilo Princess which subbed in 1998) and much more superior over the old cruiser Dipolog Princess in the Tagbilaran and Iligan route of Sulpicio Lines. Since the San Lorenzo Ruiz was not competing here versus liners with 20,000 horsepower she then just tried to match the speed of the competition which was about 17.5 knots for the Dumaguete route and 17 knots for the Tagbilaran route and that was probably a wise decision. Versus the smaller ROPAXes of 2GO which has small engines, the SuperFerry 3, Our Lady of Sacred Heart and Our Lady of Medjugorje there was no chance that she can be outsped. I thought then she had a chance in the old Dumaguete-Ozamis-Iligan-Tagbilaran quadrant, a favorite of many ships in the past from the time of ex-”FS” ships and even before. In those routes she was also the local connection of the near islands there. But then she lost over time. In shipping, it is not just the edge or the parity of the ship that matters. Even more important is the cargo which is the bread and butter of shipping. Now, the old ones also have advantage even in the passengers because of the familiarity including in the schedule. When the new millennium arrived it was already the whole company that was in trouble. They simply had too many ships from loans and there were not enough revenues and the dancing porters and free porterage plus bus links were not enough to do the trick. Soon, Negros Navigation was dropping routes and ports of calls as they found it unprofitable. The time they entered those new routes and ports was the time the country had too many liners, the product of over-expansion during the time of President Fidel V. Ramos who gave incentives for the acquisition of new ship including loans from the then government-owned Philippine National Bank. It was also the time that the true intermodal system, the combination of the long-distance trucks and buses plus the short-distance ferry-ROROs were making great advances and taking away passengers and cargo from the liners. And then there was also the budget airlines which was sucking passengers from the liners as they were already offering fares in parity with the liners. Soon, the liners of Negros Navigation was being garnished by creditors including the Tsuneishi shipyard in Cebu. Manny V. Pangilinan of Metro Pacific and Smart Telecommunications entered as a white knight and infused money and talked to the creditors and a court-mandated rehabilitation program was put in place. One result of the reorganization that ensued was that Negros Navigation was forced to hold on only to routes that were making money for them and these were basically their old routes before their big expansion from the mid-1990’s. With such a decision, liners have to be sold and many were then subsequently offered for sale by ads. However, here were no local takers and when this happened only shipbreakers from other countries are interested and in the end many of the liners of Negros Navigation ended up with the breakers including those ships transferred to Jensen Shipping. San Lorenzo Ruiz was acquired by Bangladesh breakers and in 2008 she was broken up in Chittagong. And that was the sad end of one liner I admire.